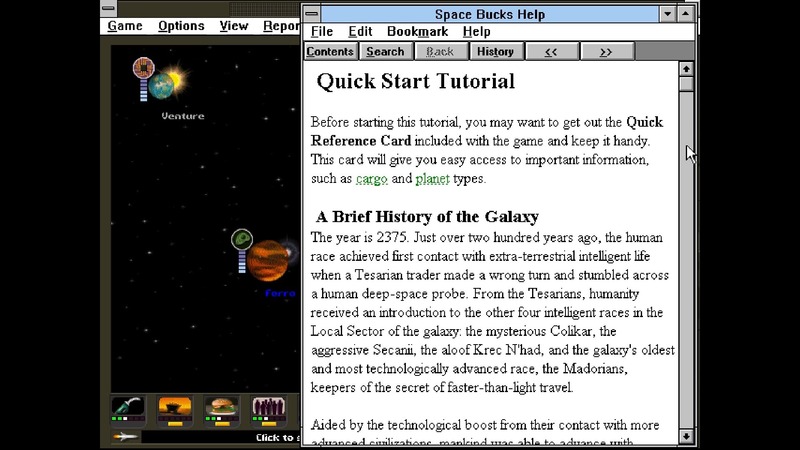 Welcome, my friends, to 1996’s Space Bucks, from Impressions Games (who later did popular city builders like Caesar and Zeus) and Sierra Entertainment! This is a space-based business simulation in which you, as a budding entrepreneur, acquire landing rights to nearby planets and ferry needed goods to them, all the while maximizing profits, improving your industrial capacity, making your starports more appealing to tourists and much more. It’s a fairly complex game, and if I hadn’t dabbled in it previously, read the in-game tutorial and watched a video or two, I’d likely be totally lost (as I couldn’t find a manual anywhere except in the game). In this entry, I try to get my space-based business off the ground by acquiring rights to new planets and then making sure their demands are met by ferrying the right types of goods, which is a more complex juggling act than I’m used to in a space game. Overall though, this is an intriguing game that I’m looking forward to learning, so stay tuned as I flail about trying to make some money, and thanks for watching!